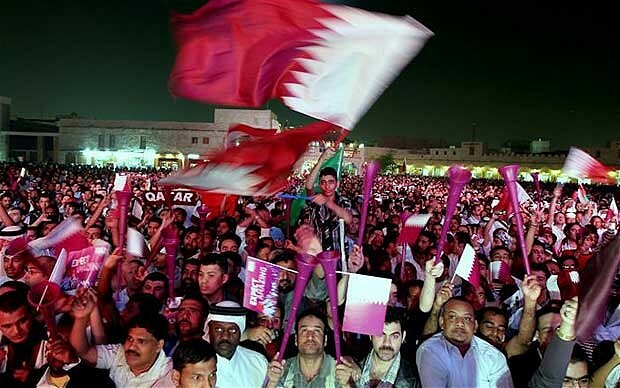 Arabdemocracy: Should we be happy that Qatar won the world cup bid? Should we be happy that Qatar won the world cup bid? As soon as the announcement that Qatar will host the 2022 World Cup was made, I tweeted that I had "no clue how I feel about this". A few days and articles later, I think I have a clearer assessment. There were so many pro and con arguments made that it was quite difficult for me to filter out the pettiness and fake pride. But all in all, the discussion centered around 4 main issues that I will briefly describe. Human rights: Some claimed that Qatar does not deserve to host the World Cup because they have a lousy human rights record, and even called on its boycott. Homosexuality is illegal. Gender equality is far from achieved. And it is illegal to drink in public (I don't know why people use this argument here.) The counter-argument, well-made by Brian Whitaker, is that things are not as bad as described and to be fair, homosexuality was illegal in the UK when they hosted the World Cup in 1966. Now of course the last statement is no excuse and I personally have zero tolerance for any kind of discrimination, be it sexual preference, gender or race. However, it seems to me like a double standard to be using Western moral criteria in this context. Just because Qatar has not reached the level of development that Britain has, it should not preclude it from participating in international activities. If this really was a big deal to the world, why not stop all diplomatic ties with Qatar, or at least stop buying their gas? Environment and sustainability: This is a very relevant issue for me and to be honest it was the first thing I thought of when I head they the Qataris were bidding. I mean seriously, sports in 50 degree weather! Do we need more air conditioning in our world? And what are they going to do with all those new stadiums? What a waste! I guess that's a pretty good argument, on the surface of it. But you know what? Cold countries use underfloor heating in their stadiums. So what's the difference? And Qatar has promised carbon-neutral technology, as well as modular stadiums that will be given to developing countries after the tournament. Now whether they actually fulfill this promise or we end up with another Masdar initiative is besides the point. We are not in a position to judge. Corruption: I am not gonna go too deep int that. So far all I am getting is hearsay with no conclusive evidence on what actually happened. Do I think some Qatari officials used back-doors to get this vote? It's very likely. But I believe that this is purely a FIFA problem. If they want to improve their reputation, they need to re-evaluate the way they process their bids. Maybe even give a justification of their final selection, instead of simply announcing a name. So basically, and in short, Qatar hosting the World Cup is not a sign of the apocalypse. It is no the worst thing that ever happened to football or the world. I say, good for the Qataris. But as a conscientious Arab woman, I say this: It means nothing to me. Yes, we should because Qatar is working hard in every field to achieve their task and doing the best job as every aspect and every field no matter it’s a sports competition or educational programs its best, in fact, you can also get the online education and recently my friend got an online bachelors degree in education. I just want to see more improvement in an education department overall it’s going good and this progress must keep going.